I am a little late on recounting this story, but it’s worth telling. 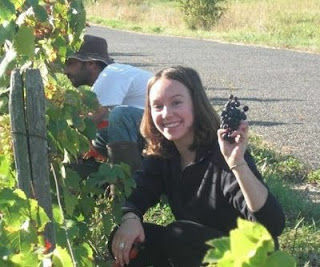 Our program director, Joelle, told us our morning class was cancelled and would be replaced by an event to do “les vendanges”, (meaning pick grapes for a winery). With all my blueberry picking experience in Lexington, MI (up north cottage for those who dont know), I was totally psyched for picking eating free grapes for a couple hours, maybe tasting some wine and then heading home. Little did I know that this “event” would involve being free labor all day, waking up at 630am, missing my first class of yoga, and leaving a buzzed on wine/ champagne Colleen to navigate the bus system to make it on time to teach/ train with pre-teens on aerial fabric at the Astuces circus school. Lovely, but that is another story. Back to “les vendanges”. We started out cold, damp, and slightly confused. I was really glad I made the decision to wear my hiking boots, I think I was the only one with dry feet that morning (except for the professional pickers with whom we worked). 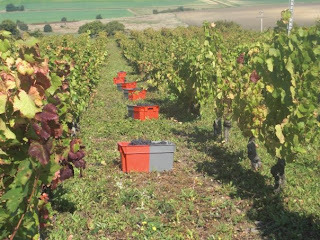 The grape vines are arranged in rows, and it takes two people (picking partners) to do each one. Each American student got a partner, mine was Christopher, a thirty-something who looked twenty-something who had been picking there since he was 16. He just had his first child with his wife, can juggle a little and loves snow (and skiing). Eventually I got a few different partners because Christopher started to occupy himself with helping people empty out their full buckets and exchange them for empty ones. We worked like this for about an hour, then took a break. This break involved cigarettes, cheese, bread, and of course wine. Also, a type of suspicious gelatinous pâté which I sneakily spit out while pretending to admire the view of the landscape. Later I found out that the suspicious pâté was lamb brains. Awesome, thanks for tricking me you crazy French country people, you’re hilarious. So these ten minute breaks happened about every hour, and by 11am we were feeling pretty good. 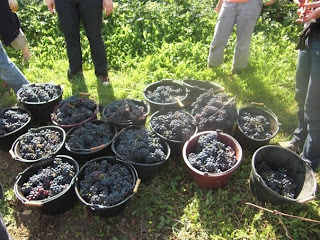 I commend the people we were working with for their multitasking: smoking, talking to foreigners, and using pruning shears to cut grapes. Well done. They worked so fast, it was hard to keep up at first (especially when I wanted to eat grapes all the time!). I kept pretending to need to “taste” them for ripeness, when really I just wanted to eat some. I bet that my partners caught on, but I couldn’t resist. When I thought I was getting pretty good at this whole snipping grapes thing, I managed to carelessly snip my finger a little bit in the process. Woops. Who knows the cure? An old Portugese man who appeared to have very few or no teeth at all (who speaks incredibly cryptic French because of that, and because he is Portuguese)! I give him the look of, “I have NO idea what you want me to do”, he repeats again, a little bit forceful, “écrase les raisins!! 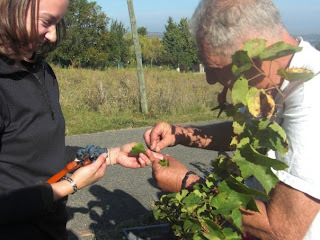 !”… again I look at him like he’s a Portugese man with no teeth speaking muffled French to me in a grapevine (because he is)…he grabs my hand, smushes grapes all over my cut, wraps my finger with a grape leaf, ties it with another, and smiles “ta da!”. Oddly enough, my friend Kristen was able to snap a photo of this event (see below). My cut felt totally fine the next day. Each time we paused, I kept thinking we were about to be done, but then we would walk to another field, and continue picking even more. 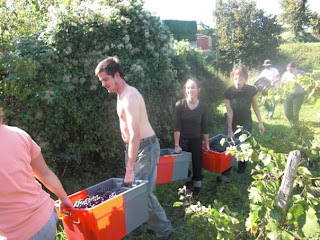 When we had finished a field, we made “trains” of people carrying the large baskets of grapes to the vans for pickup. I learned the hard way that being at the end of the train is the worst. After the work was over, it was time to play! Play involves a 3 hour long HUGE meal cooked by a giant man (the uncle of the owner of the vinyard), for 17 people. A witty poem/toast by the father of the owner, a witty response toast from the Americans (thanks Katie), several bottles of wine, and countless numbers of laughs later, we were ready for naps. The meal was a great reward for all our work that day. Our new friends at St. Georges were so different from some of the other French people we had encountered up until then at our elite business school back in Clermont-Ferrand. They were no-nonsense, open hearted, and felt like a family. A strange mix of people made for an awesome community for the afternoon: the 7 Americans, the owner of the vinyard, his huge joke-cracking amazing cook uncle, his sincere dad, the usual pickers, our resident director (who abandoned us with these “strangers” at the beginning of the day) and her unassuming husband (who tried to make one of the students not feel bad for being vegetarian though his wife was pretty hard on the student for having this “lifestyle”), and of course the old Portuguese man whose relation to all of the other people is still ambiguous to me. But I guess it doesn’t matter who that crazy guy was because at that dinner table, we all became related because we shared the spirit of doing “les vendanges” together that day.